During the budget debate, Parliament increased the 2011 expenditure for the heavy oil power project by $282 million, and made other increases. On 28 January, they approved the budget after increasing the amount to be transferred from the Petroleum Fund to $1,055 million, which is $321 million above the Government's optimistic estimate of the sustainable income. This graph shows how the new budget compares with the proposed one, and with past expenditure levels. Parlamentu Nasional aumenta gastu iha Orsamentu Estadu 2011 ba tokon $320, inklui tokon $282 ba projeitu oleu pezadu. Iha loron 28 Janeiro, sira aprova ona OJE, maibe hasai transferensia husi Fundu Petroliferu iha tinan 2011 to'o bilaun $1,055, $321 liu Rendimentu Sustentavel Estimatiza. Bele hare mudansa iha grafiku tuir mai. Grafiku ne’e hatudu balansu iha Tezoriu (Konta Bankaria Governu nia ne’ebé la’o hela) iha fin husi kada trimestre, no mos montante ne’ebé transfere husi Fundu Petroleu ba Tezoriu kada trimestre. Balansu Tezoriu sa’e iha fin de kada tinan fiskal (Juñu 2007 no Dezembru 2008-2010), tanba Governu rai nafatin osan ne’ebé la uza husi Fundu Petroleu atu bele gasta fali iha tinan oin mai, hodi viola prinsipiu sira Lei Fundu Petroleu nian. Iha tinan ikus 2010 nian, konta Tezoriu nian rai osan tokon $340, nivel ida ne’ebé too oras ne’e aas liu iha Timor-Leste nia istoria. Proposta orsamentu 2011 inklui tokon $141 husi ida ne’e, ne’ebé sai dalan ba governu atu gasta osan barak liu sein nesesidade atu hasa’e taxa no rendimentu sira. Ne'e metodu ida ne’ebé perigozu, halakon responsabilidade fiskal no orsamentu ne’ebé honestu. This graph shows the balance in the Treasury (the Government’s operating bank account) at the end of each quarter, as well as the amount transferred from the Petroleum Fund into the Treasury each quarter. The Treasury balance increases at the end of each fiscal year (June 2007 and December 2008-2010), because the Government saves unused money from the Petroleum Fund to spend in the following year, in violation of the principles of the Petroleum Fund Law. At the end of 2010, the Treasury account held $340 million, by far the highest level in Timor-Leste’s history. The proposed 2011 budget includes $141 million of this, which is a way for the Government to spend more money without having to increase taxes or revenues. It is a dangerous method, undercutting fiscal responsibility and honest budgeting. Parlamentu Nasional Timor-Leste hahú dekada ne’e ho debate orsamentu ne’ebé bele predikte ona katak sei la’o ho diskusaun plenária makaas kona-ba proposta orsamentu billaun dollar ba Orsamentu Jeral Estadu 2011. Iha konkluzaun husi diskursu ne’ebé naruk Primeiru Ministru Xanana Gusmão husu ba ema hotu-hotu atu “mantein armonia i maturidade polítika, se ita la respeita valór diálogu ho direitu ba diferensa opinoens, nebé tenke konstrutivas.” Maibé, konstrutividade la bele determina deit husi rona nain sira, no la hanesan ho basa liman nebe la kritiku. Governu nia polítika ekonomia sira tenki bazeia ba data nebe sólidu. Tenki halo revizaun ba ajensia autónomu sira no inklui sira iha orsamentu estadu (liu-liu ajensia petroleu no jogo nian). Fundu kombate pobreza ba Presidente nian tenki kansela. Tenke aumenta prioridade ba sektor saude, edukasaun no agrikultura. Tenki oferese informasaun kompletu kona ba kustu ba sentral eletrisidade Hera. Atu projeksaun folin mina nian halo ho prudente no konsistente liu. Fundu Espesial labele kria sein informasaun kompletu no fundasaun legal, no fundu infrastrutura boot demais. Osan hasai husi Fundu Petrloleu nebe la gasta tenki husik iha Fundu Petroleu iha tinan nia rohan. Debate Plenariu ne’e sei gasta semana ne’e tomak, no desijaun ne’ebé sei halo bele, tuir Primeiru Ministru nia lian, “mai ita servisu hamutuk ba konsolidasaun no estabilidade polítika ho sosiál no ba kresimentu i dezenvolvimentu reál ba tempu naruk nian." Iha loron 14 Janeiru, tuku 7 kalan, Plenariu aprova orsamentu iha jeralidade, 43-21. Debate kona ba spesialidade atu kontinua semana rua tan. Maski La’o Hamutuk koalia momos ona iha ami nia kritika no sujestaun sira kona-ba orsamentu ne’e, ami tuir PM nia esperansa ba futuru ida nebe diak liu ba Povu Timor-Leste. Ami husu ba membru Parlamentu sira hotu, lideransa no komentador sira atu hanoin dook liu eleisaun tinan oin tanba ita-boot sira partisipa iha debate ida nebe importante. 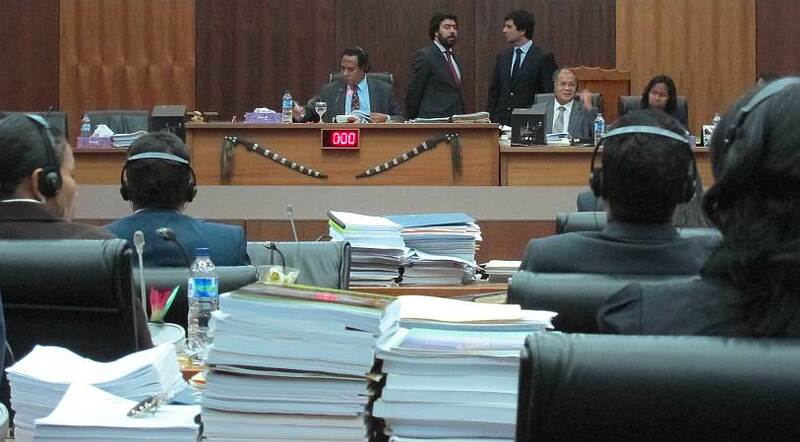 The National Parliament of Timor-Leste started the decade yesterday with the predictable vociferous plenary discussion of the proposed billion-dollar state budget for 2011. At the conclusion of a long speech, (Tetum original) Prime Minister Xanana Gusmao urged everyone to "maintain political harmony and maturity, to respect the value of dialogue and the right to have different, although constructive, opinions." However, constructiveness should not be determined only by the listener, and is not the same as uncritical applause. Solid data should underlie the government's economic policies. Autonomous agencies should be reviewed and included in the state budget (especially the Petroleum and Lottery agencies). The President's anti-poverty fund should be canceled. Greater priority should be given to health, education and agriculture. Complete cost information about the Hera power station should be provided. Oil price projections be more prudent and consistent. Special funds should not be created without complete information and legal foundation, and the infrastructure fund is too large. Unspent Petroleum Fund withdrawals should be left in the Fund at the end of the year. The plenary debate ended on Friday evening, with 43 votes in favor of the budget in generality, 21 against (Fretilin), and one abstention (Manuel Tilman, Kota). The debate on specifics and amendments will run for two weeks more, and the decisions made could, in the Prime Minister's words, "mark a new start for Timor-Leste, where we will work towards the consolidation of political and social stability and achieve real long term growth and development." Although La'o Hamutuk has been outspoken in our critiques and suggestions about this budget, we join the PM in hoping for a better future for the Timorese people. We urge all Parliamentarians, leaders and commentators to think far beyond next year's election as you participate in a vigorous debate on the budget. Konvite Diskusaun Publiku Lei ba Rai, 19 Jan.
Koalia kona-ba Rai iha Timor Leste komplexu no sensitivu tebes. Asuntu rai ne’e sai preokupasaun ema barak nian, tantu husi povu, estadu Timor-Leste nomos ema husi rai liur. Preokupasaun sira ne’e mosu tanba asuntu rai ne’e bele hamosu konflitu iha komunidade nomos difikulta prosesu dezenvolvimentu. Ho razaun hirak ne’e Governu Timor-Leste liu husi Ministeriu Justisa kria ona Esbosu Lei ba Rai atu regula se mak bele sai nain ba rai. Ministra Justisa halo konsultasaun Lei ba Rai iha distritu 13 iha 2009, no hetan aprovasaun husi Konsellu Ministru iha loron 10 Marsu 2010. Lei relasiona ho Rai ne’ebé aprova inklui Lei ba Rai, Lei Expropriasaun no Lei Fundu Imobiliariu. Lei tolu ne’e atualmente sei iha Komisaun A, Parlamentu Nasional, no Parlamentu Nasional sei halo audensia publika kona-ba Lei ba Rai iha inisiu 2011. Husi parte seluk Sosiedade Sivil, Estudante Universitariu sira ho Komunidade rasik konsidera katak Lei ba Rai ne’e la bazeia ba prinsipius no valores moris Timor nian. Ita bele hetan nformasaun tan kona-ba asuntu Rai iha ne'e. Sr. Demetrio Amaral nudar Peskizador ba Sistema Rai Tradisional iha Fundasaun Haburas. Land is a very complicated and sensitive issue in Timor-Leste. Many people, including grassroots people, the State and internationals, are concerned that land disputes can create community conflicts and also create difficulties for development. The Timor-Leste Ministry of Justice has drafted laws to regulate who can own land. The Justice Minister held public consultations in all 13 districts in 2009, and on 10 March 2010 the Council of Ministers approved three laws: the Land Law, the Expropriation Law, and the Compensation Fund. The laws are currently before Committee A of the National Parliament, which will hold public hearings early in 2011. From the view of civil society, university students, and communities, these laws are not based on the principles and values of Timorese life. Click here for more information about land in Timor-Leste. On 14 December 2010, La'o Hamutuk wrote a letter to the IMF updating and augmenting some of the observations and findings in their recent “Report on Observance of Standards and Codes (ROSC)—Fiscal Transparency Module” and “Public Financial Management—Performance Report” on Timor-Leste. We wrote "As the (IMF) reports point out, there are some strengths and many weaknesses in budgetary and planning processes here. We appreciate your frank discussion of these issues, especially regarding the shortcomings in accountability and planning. "Unfortunately, since your team visited last January, a number of things have deteriorated. The situation in Timor-Leste changes quickly, and the past ten months have seen a mid-year budget revision, a shortened calendar for enacting the annual state budget, and a reduction in the amount of information shared with the public. Several imminent legislative and budgetary actions – including extra-budgetary funds, new autonomous institutions and revisions to the Petroleum Fund Law – will further undermine fiscal transparency and accountability if they are enacted. ..." Our five-page letter described recent developments, corrected erroneous or outdated information, and filled in some gaps in the IMF reports. "We very much appreciate La'o Hamutuk's constructive input and dialogue on public financial management issues. With your government's permission, we hope to continue that dialogue in coming years." La'o Hamutuk will continue to share information with the IMF, the public and others without asking for permission from the government of the day. The right to do this is enshrined in Articles 40, 41, 46 and 48 of the Constitution of the Democratic Republic of Timor-Leste. We hope that many people and institutions will speak up about important public issues, and not be deterred by the increasing tendency of some officials to "shoot the messenger" who provides information that they would rather nobody knows about. At the 15 December Parliamentary hearing of Committee C on the 2011 State Budget, the Committee asked La'o Hamutuk to add to our submission on a few topics. On 4 January, we wrote a letter, abridged here. The budget for the electric grid will not meet contractual obligations. In our submission, La’o Hamutuk encouraged Parliament to ask the Government for cost projections for multi-year capital projects in the Infrastructure Fund. The next day, the Ministry of Finance gave Parliament Budget Book 6, listing expenditures by project through 2015. On 15 September , the Government forced CNI22 to subcontract the power stations to the Indonesian company Puri Akraya Engineering, increasing the cost by $261,548,746. The cost will grow significantly higher when CNI22 implements the Government’s directive to subcontract much of the power grid , and when essential items omitted from the original plan (such as jetties for unloading the fuel) are included. In summary, the Government is legally obligated to pay $116,300,000 more in 2011 alone than Parliament has been asked to approve. We suggest that Parliament ask Government to amend its budget proposal to include this commitment so that you can make more informed decisions. Some state organs pay more to advisors than to their own personnel. Some state institutions rely extensively on Timorese and international advisors and consultants who are paid much more than public servants. Although some of these costs are paid by donors, many are Timor-Leste’s own money. We highlight organs whose allocation for “705 Professional Services” is more than for salaries and wages. These 13 organs receive only 6% of the total salary budget, but they will receive 56% of the Professional Services allocation. Although some “Professional Services” costs are hidden subsidies, most go to high fees to individuals. We hope that Parliament will look into which are necessary and appropriate. This is especially important now, because the Government hopes to create several new agencies soon which will be exempt from civil service salary rules. Overspending last year’s ESI in 2011. President Manuel Tilman asked for La’o Hamutuk’s thoughts on using $140.9 million of the treasury balance from the end of 2010 to fill the deficit in the proposed 2011 budget. This is the only way the Government can pay for $985 million in 2011 expenditures without withdrawing more than the (greatly increased) Estimated Sustainable Income from the Petroleum Fund. La’o Hamutuk’s submission to Committee C on the 2010 Rectification Budget explained that transferring $311 million above the ESI from the Petroleum Fund during 2010 for the purposes in the budget would violate the Petroleum Fund Law. We wrote that “We do not understand how increasing the treasury balance is ‘in the long-term interests of Timor-Leste.' ” Our submission last month on the 2011 State Budget said that the $140.9 million being carried over from last year to this year should be considered as coming from the Petroleum Fund. La’o Hamutuk believes that the Petroleum Fund law requires that money transferred from the Petroleum Fund for a particular year’s budget must be used during that year for the purposes cited in that year’s budget documents. Article 7.2 of the Petroleum Fund Law refers to the “amount transferred from the Petroleum Fund for a Fiscal Year (O montante total das transferências do Fundo Petrolífero para cada Ano Fiscal),” not “in a Fiscal Year.” This makes it clear that the money transferred should be expended during the Fiscal Year for which it was authorized. If some has not been spent by the end of the year it was appropriated for, it should be returned to the Fund. Consequently, the requested transfer from the Petroleum Fund in the proposed 2011 budget exceeds the (imprudently optimistic) estimate of the sustainable income by $140.9 million, and the Government must provide the information required by Article 9 of the Petroleum Fund Law. The Government’s interpretation of the Budget and Financial Management Law regarding Special Funds would undermine Parliament’s Constitutional authority. Articles 32.5 and 32.6 of Law No. 13/2009 on Budget and Financial Management state that expenditures from Special Funds require authorization from the Minister of Finance, and that Parliament must have previously been given estimates of revenues and expenditures for the Special Fund within the fiscal year. The proposed 2011 State Budget Law includes general lists in Articles 9.2-9.3, with a little more information in Annexes II-B and II-C . However, this is insufficient to allow Parliament to decide on more than $350 million in expenditures during this year alone. Budget Book 6 provides additional information about estimated expenditures from the Infrastructure and Human Capital Development Funds, although we believe that it should be more specific and detailed. Parliament should amend Article 9 of the proposed Budget Law to incorporate the list in Budget Book 6 as part of the law, stating that the Government must inform Parliament in advance of any changes to that list, either between projects or from one year to another. If this amendment is not made, Parliament cannot fulfill its responsibility to approve “a breakdown of the revenues and expenditures of the State” and will violate Articles 145.1 and 145.2 of the Constitution of RDTL. The Infrastructure Fund is a dangerous precedent and premature expenditure. President Tilman also asked our views on the $317 million allocated the Infrastructure Fund. These are explained in our December submission to Committee C, and further elaborated above. In summary, we urge Parliament not to approve the Infrastructure Fund until it has debated and ratified the National Strategic Development Plan, and until the mechanisms to implement the Plan and manage the Fund are in place. It would be premature to appropriate so much money without clear legal processes to ensure that it will be managed well and spent wisely to advance the interests of the people of Timor-Leste.